While resort and hospitality majors at Florida Gulf Coast University already boast a 100 percent placement rate upon graduation, the program is on track to take their education to a higher level – literally. 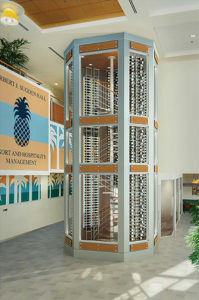 Considering the importance of wine in Southwest Florida, where the Naples Winter Wine Festival and the Southwest Florida Food and Wine Fest raise millions of dollars each year for charity, the School of Resort & Hospitality Management has plans to add a wine tower, tasting room and other elements to upgrade wine education. Randy Upchurch, the school’s director, says that he believes that expanding opportunities for students to learn about the wine industry just makes sense. 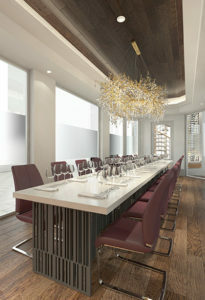 The plan includes a two-story wine tower that will hold 700 bottles of unusual and rare wines. It will be built in the entry lobby of Sugden Hall, where the reception desk now stands. Next to that will be a tasting room, which could double as a private dining room, with a display case for Riedel wine glasses as well as about 20 glass etchings displayed around the room. The project began simply as a wine vault, a secure and temperature-controlled unit in which to store these higher-end wines. But discussions with representatives of the Culinary and Education Foundation (CHEF) brought the project to the attention of local wine aficionados Jim and Laura Dixon. The Naples couple are trustees of the Naples Winter Wine Festival and own both the Naples Wine Collection and The Cave Bistro and Wine Bar. They recommended a tower to make the best use of the limited space available. The Dixons have pledged $250,000 to build the tower and are helping to bring in additional donors to contribute toward the rest of the elements. Upchurch says that, assuming additional donations can be found, the tower and tasting room could be operational by fall. For details or to donate to the project, contact Bill Rice at [email protected] or (239) 590-1077.